US, 1935, 101 minutes, Black and white. Wallace Beery, Lionel Barrymore, Eric Linden, Spring Byington, Mickey Rooney, Aline Mc Mahon, Charley Grapewin, Cecilia Parker, Frank Albertson, Bonita Granville. 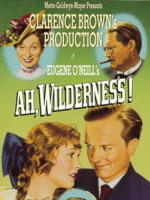 Ah, Wilderness is a very pleasing version of Eugene O'Neill's nostalgic play about the turn of the century. It was written for the screen by Albert Hackett and Francis Goodrich (and later adapted and musicalised in the '40s as Summer Holiday). The film has the M.G.M. treatment and is directed by veteran director Clarence Brown. 1. A pleasing film of recollection, nostalgia? A piece of Americana? A '30s perspective on the turn of the century? 2. The play in the canon of Eugene O'Neill's plays? The contrast with his memories as in Long Day's Journey Into Night? A cinematic version of his play? 3. The quotation for Ah, Wilderness, the ending, the memories of youth and spring? 4. Production values: black and white photography, M.G.M. sets, strong cast? The atmosphere of 1906: costumes, decor? Manners and behaviour? Music and songs? 5. The Miller family and the introduction to each of the characters: father and the paper, the patriarch of the family? Mother and her care, the house? Lily and her role in the house, the spinster, in love with Uncle Sid but refusing to marry him for 18 years? Sid and his drinking, genial presence? Tom and the boys? Richard? Art? The girls? 6. The focus on Richard, his youthfulness, age and idealism, his reading? Relationship with Muriel? His preparation of his speech, his being cut off by his father, his high hopes and hopes for revolution? 7. The farewell to Uncle Sid - and his return? Life in the town, at home, Muriel's father and her complaint about Richard, the letter, his being upset, Muriel refusing to see him? The background to the Fourth of July? 8. The Fourth of July, the picnics, Tommy and the fireworks waking his parents, Sid and his drinking and trying to get into the house? 9. The build-up to the dinner, the question of the fish, the laughter, Sid's drinking, everybody laughing, Lily's heartfelt reaction about everybody laughing at him and not helping him? Richard's anger and his outburst against Aunt Lily? 10. Richard going to the bar, meeting the woman, getting drunk, the long talk, pouring out his heart, the manager, his being ousted - and people knowing that he was the editor's son? 11. The importance of the final talk with his father, the attempt to talk about the facts of life, the bond between father and son? 12. The reconciliation with Muriel, Richard's father telling off her father, going out secretly to meet, the misunderstandings, the happiness in their friendship? 13. The sketch of the characters of Uncle Sid, of Lily, of mother and father? Of the brothers and sisters? The atmosphere of the town, school and the holidays, teachers, graduation and valedictory speeches? 14. The happy ending, father and mother and the speech about being surrounded by love?